It’s not a snowpocalypse, but considering it’s only the second week of November and the city’s Sanitation Department has issued a “snow alert” for 8pm on Thursday, it might as well be. According to the forecast, the temperature’s going to drop close to freezing tonight, turning the predicted light rain into a mix of snow flurries. That means it will officially be Snowvember when you wake up on Friday. Just how much snow are we talking? 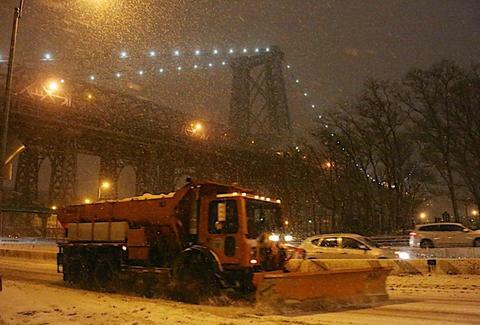 The forecast says that the snow is only expected to hit the city for a few hours in the early morning, but from the ominous tone of the DSNY Tweet claiming that the “salt spreaders are loaded and ready to be deployed”, we could all wake up in a winter wonderland -- and not the kind where jolly, magic snowmen run around. To make sure you're well-prepared, be sure to stock up on all the essentials (beer, pizza, more beer) 'cause snow in NYC definitely ain't thrillin'. Emily Kolars is an Editorial Assistant at Thrillist. She might be the only person in the city who's stoked to see snow in the morning. Blame it on her Minnesota roots and follow her on Twitter as she documents her excitement.